Did you know that there is a global community of people dedicated to the values of Collaboration, Openness, Community, Accessibility, and Sustainability in their workplaces? It’s called Coworking. And people seem to think it’s swell. You can usually find the pulse of coworking in the discussions held at the Coworking Google Group. Introduce yourself today. 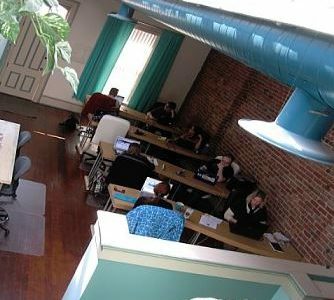 Business models, best practices, and 700+ pages of knowledge-base can be found on the Coworking Wiki. Learn, contribute, and help garden the wiki. Announcements and press find their way on to the Coworking Blog. Look for @GoneCoworking posts and suggest new content.